Seberang Perai Tengah (SPT) district police chief ACP Nik Ros Azhan Nik Abdul Hamid said the 21-year-old driver burst into tears when told about the death of Moey Yun Peng, 20, in the 2.54am incident. 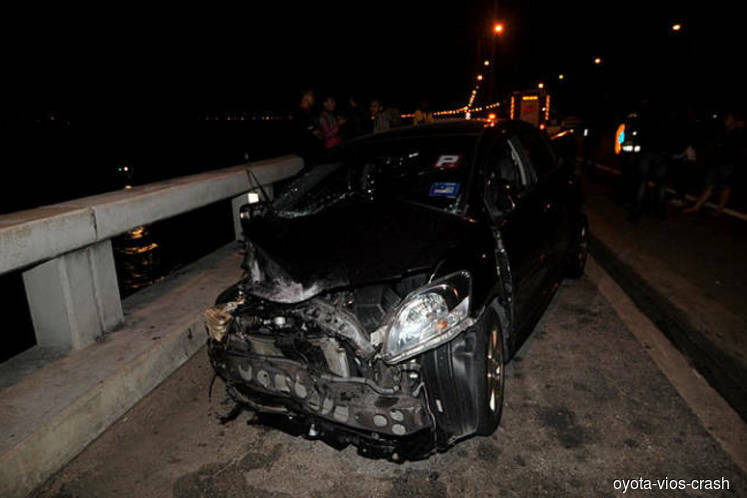 Moey, a college student, was killed after his SUV plunged into the sea after being rammed by the Toyota Vios car at KM 4, Penang Bridge Perai-bound. “When his condition (while being treated for his injuries) was improving at the hospital, we informed him of what had happened to his friend, and he looked dejected and sad,” he told Bernama here. The man who worked as a hairdresser at his mother’s salon also repeatedly apologised as he felt that the accident was triggered after he lost control of his car and crashed into his friend’s SUV. “He also said that he was ready to accept any punishment from the court,” Nik Ros Azhan said. The man was arrested by police after surrendering at the SPT district police headquarters at 2am on Wednesday but was released on police bail at 6.45pm the same day after his statement was recorded. Meanwhile, Nik Ros Azhan said the investigation papers on the incident were expected to be completed by Monday and was just waiting for results of tests for drugs and alcohol. He said the accident was investigated under Section 41 (1) of the Road Transport Act 1987 for causing death by reckless or dangerous driving.